Those table runners look really cool. Do I have to take a class or is there a tutorial somewhere? A long arm is on my "someday" list. Unfortunately someday is a long way off. What kind do you use? your table runners are awesome! Love the puff balls, personally. I say keep them. Just incorporate a smidge more navy perhaps? 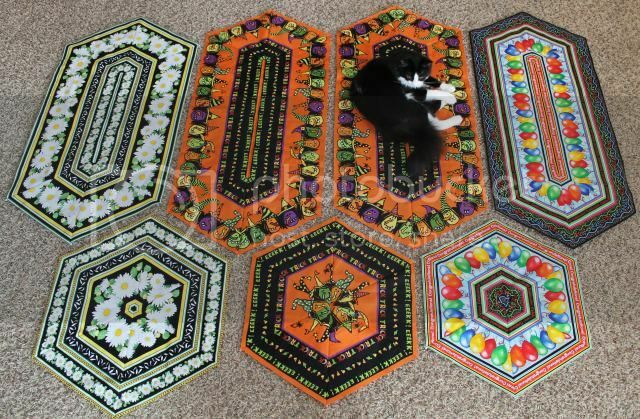 I'm interested in these table runners. How does it all work? I'm a little slow tonight. Resisting the siren call of "Sherlock!" I am completely loving those table runners. It is a totally worthwhile addiction. :) Plus your are making great progress. Love the table runners! There are worse additions than those for sure! I'd keep the navy too, but add some more of the same tone somewhere else. wowsers! You are going great guns! Nice runners/toppers! You have some wonderful projects and the runners are so neat! 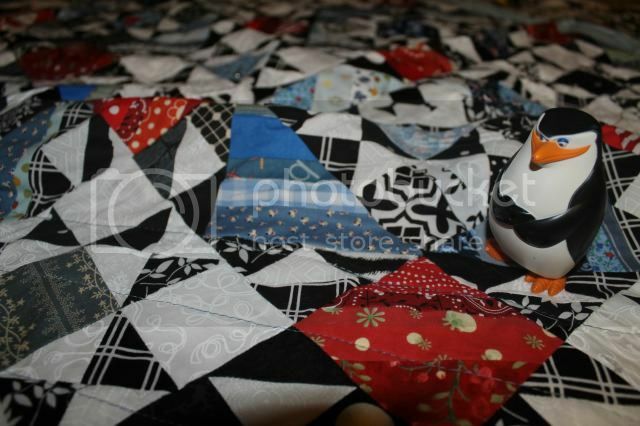 I think trying to use a walking foot on one of Bonnie's mystery quilts would be hard on a domestic. I just do a medium size stippling on mine and don't have any problem. Thanks for sharing. so much to see! 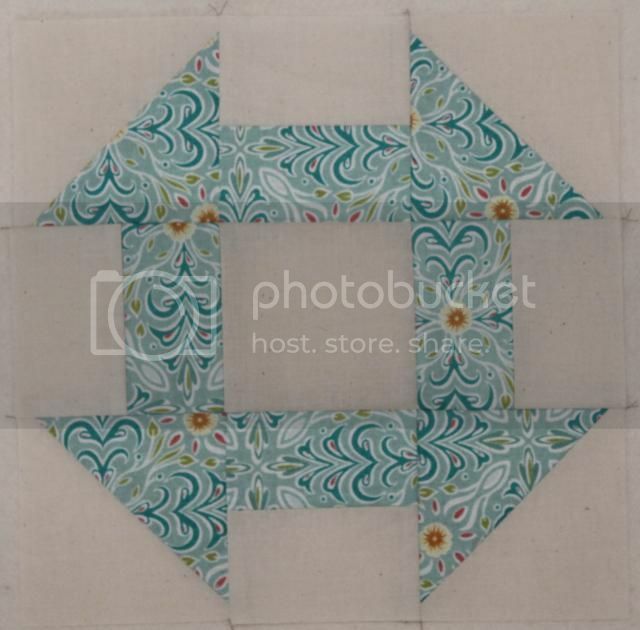 I particularly like the homey colors and feel to your log cabin quilt. those spin cycle fabrics are looking bright and cheery, too. sorry about all the unpicking. =( been there. but if it will make you happier with the quilt in the end, it's worth it! Your table runners are awesome. I think I would need more than just my hand held for support. They look SO hard. 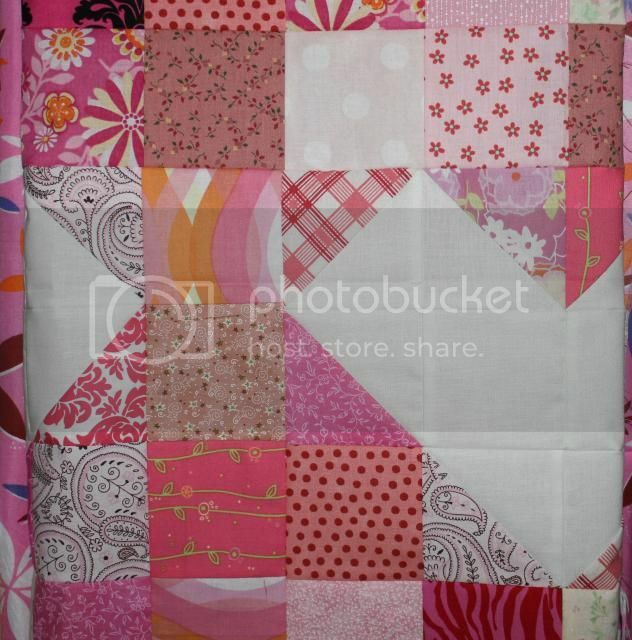 Also, I love you Vera Bradley quilt. I am now retired and am bona sell all of my VB pocket books. I have so many. I loved her things. Your chunky log cabin caught my eye, too. I would love to make one of those. I like your honesty in admitting the quilting was not good. I certainly have a problem admitting it myself. I had two bad rows on a charity quilt last month and I unpicked them and just re-quilted them this month. I did not mention it in my blog because I was too embarrassed. Thanks for sharing! Churn Dash is one of my favourite blocks. Looks great in teal. Spin Cycle is showing good progress. 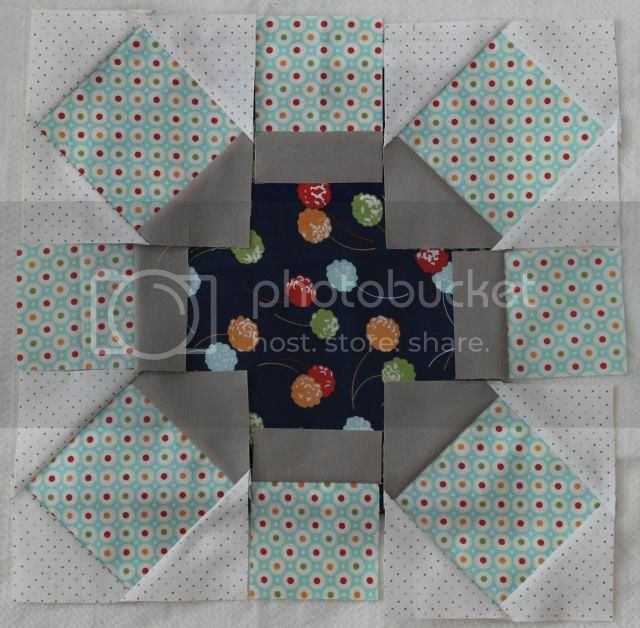 If you have a dark blue block the dark centre spin cycle block should work just fine. 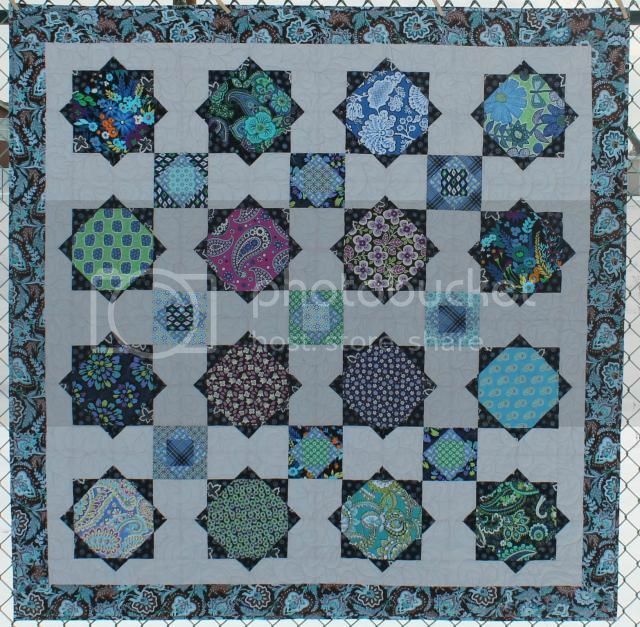 You have some beautiful table runners, and a great teal churn dash block. Well done. So much accomplished this week! Love your little churn dash block. Too cute. You deserve a Gold Sticker for all you've accomplished - awesome! I love your table runners. And I had to laugh, because on Thursday I finished up the last episode of Downtown Abbey (got them through Amazon Prime), and now I don't know what to listen to/watch during my sewing sessions. I'm having Downton withdrawals already - gasp!!! Wow! You got a lot done this week. Such pretty blocks - that churn dash is calling to me. I'll have to start making mine this week. Wow Kate, you are one busy girl! Love your table runners, I have never seen that pattern before! 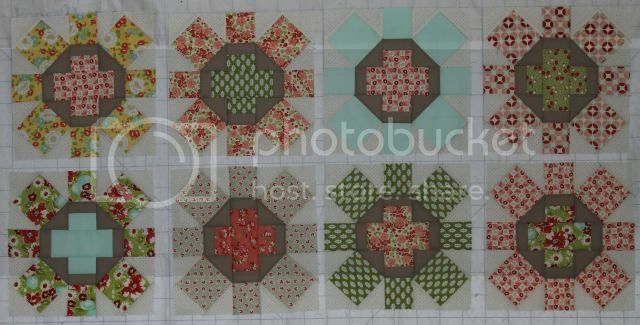 I can't wait to see how these quilts look finished! Oh, and I can't imagine unpicking all of that work---I would not have the patience! 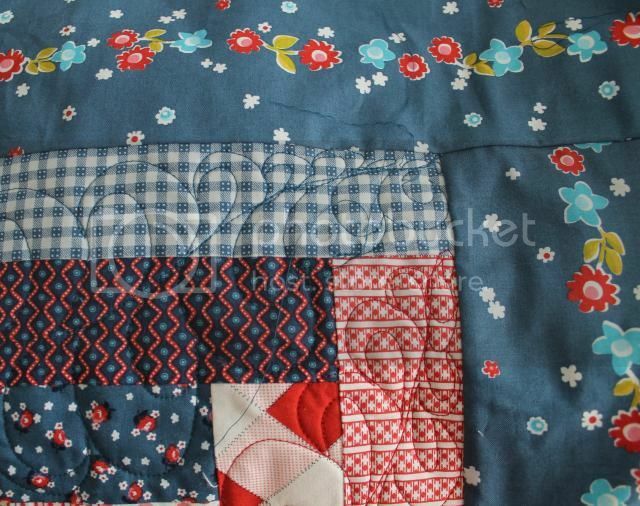 Can't wait to see how it looks when you re-quilt it! Chunky Log Cabin - Finished!